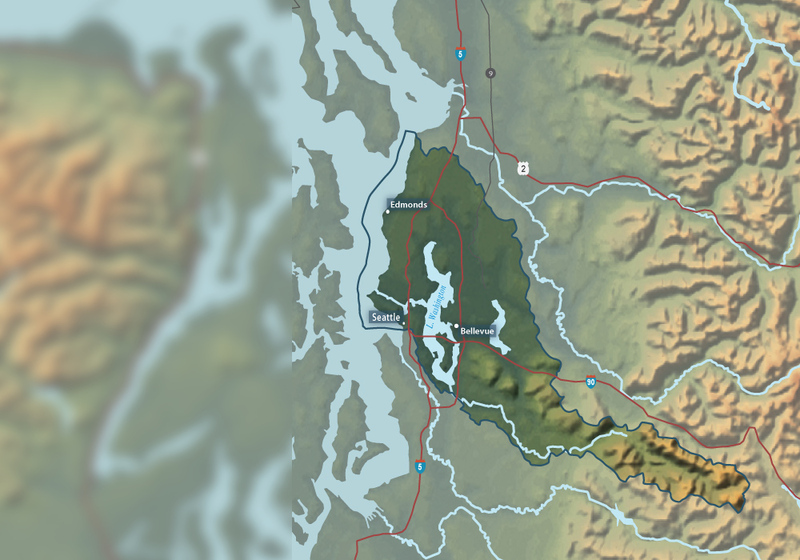 The Lake Washington/Cedar/Sammamish Watershed (WRIA 8) covers 692 square miles. It contains two major river systems, three large lakes, and numerous creeks. Water flows from wild headwaters through major cities, including Bellevue and Seattle, and out the Hiram Chittenden Locks into Puget Sound. As the most populated watershed in the state, our shared goal is to make the watershed a place where salmon and people can live together. For more information visit: www.govlink.org/watersheds/8/. For salmon viewing opportunities click here. 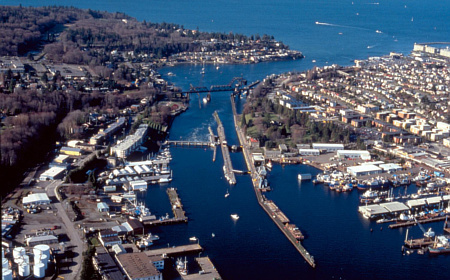 Every salmon in the Lake Washington/Cedar/Sammamish Watershed must migrate through the Hiram H. Chittenden Locks as a juvenile heading out to the ocean and an adult returning to spawn. 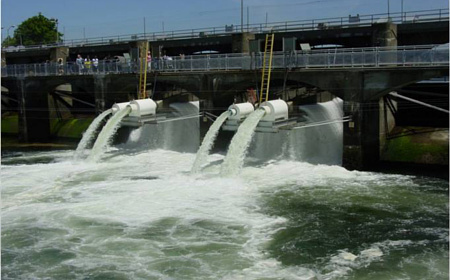 The 'smolt slides' provide a safe way for young salmon to migrate through the Locks each April-September. From July-September, you can also view migrating adult salmon through the Locks fish window. 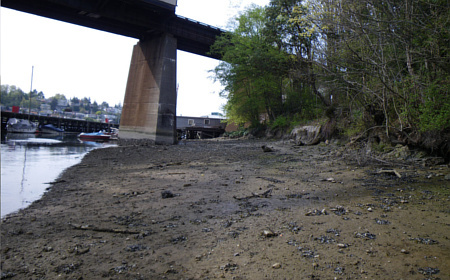 This project protected and enhanced the last undeveloped, wooded shoreline on Seattle's Salmon Bay immediately downstream of the Locks. 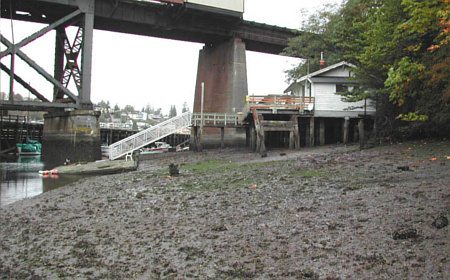 This 2004 'before' photo shows the dock, overwater structure and riprap at low tide. The City of Seattle and project partners removed the overwater structure, dock, pilings and riprap and restored the shoreline vegetation. 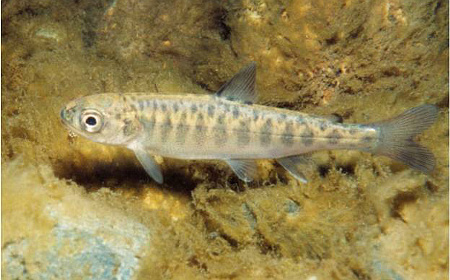 Millions of juvenile salmon use this enhanced transition zone between salt and freshwater. A viewing area with art and educational signage explaining the project was constructed above the property, a short walk west on the Burke-Gilman trail from the Locks parking lot. 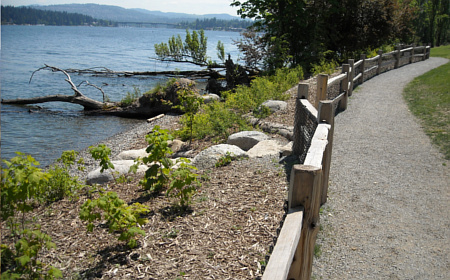 RiverWalk is a one-mile stretch of restored river habitat along the Sammamish River Trail. 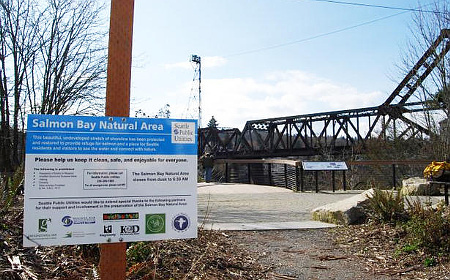 Moments from downtown Redmond, RiverWalk offers a unique glimpse into how urban areas can embrace restoration. 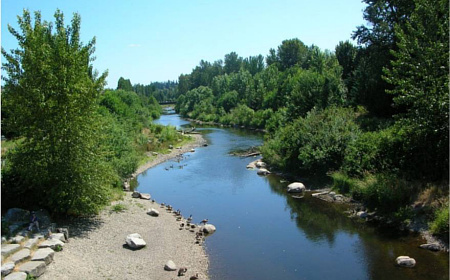 This section of the Sammamish River offers habitat for fish and wildlife, and a natural landscape in which people can relax, exercise and reconnect with their surroundings. 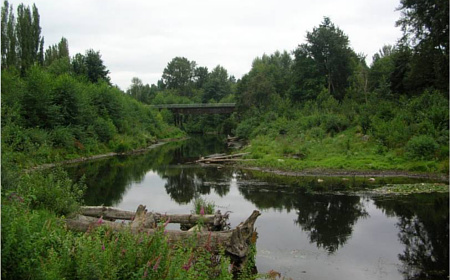 Straightened by the US Army Corps of Engineers in 1965, much of the channel in this section of the Sammamish River has been restored by re-meandering the river, placing logs in the riverbed, and planting native plants. These actions improve rearing conditions for young salmon and provide refuge to adult salmon migrating upstream. Otter, beaver, muskrat, osprey, bald eagles, herons, waterfowl and song birds also use the restored habitat. 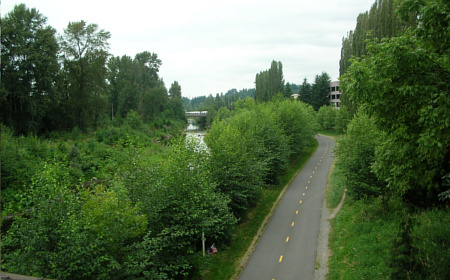 RiverWalk runs between Leary Way, near Redmond Town Center, and the NE 90th Street Bridge. 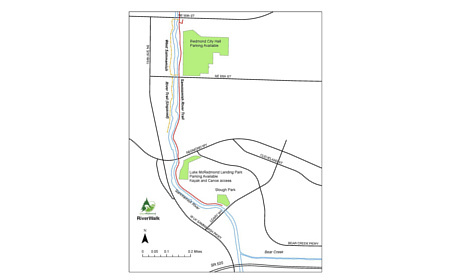 Parking is available at Redmond City Hall and Luke McRedmond Park. The park also offers kayak and canoe access. 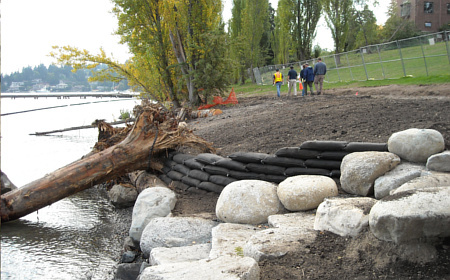 This project, completed in 2009, transformed Luther Burbank Park's steep, inaccessible shorelines into more gradual sloping shores. 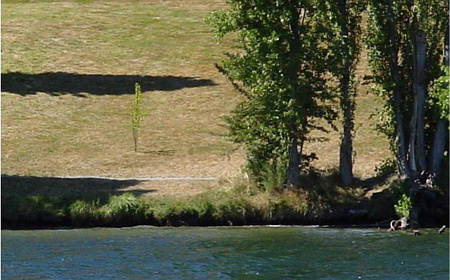 The City of Mercer Island removed the bulkhead and replaced it with large wood anchored to the shoreline to minimize erosion. Gravel was added to create a more gradual shoreline. Many native trees and shrubs were planted along the shoreline. 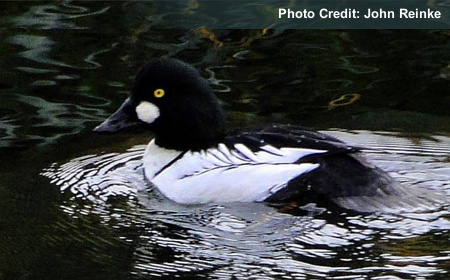 They provide visual interest along with habitat for native fish and wildlife. The restored shoreline is much friendlier to migrating juvenile salmon. It provides needed shallow water and overhanging shoreline vegetation for food and shelter. To date, about 1,350 feet of shoreline has been restored. 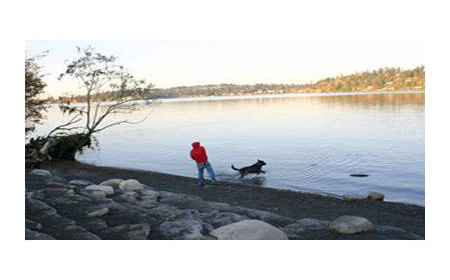 The City of Mercer Island plans to do a second phase, which will restore an additional 600 feet of shoreline.